Tools to help get the job done! Disclosure / affiliate links applicable. 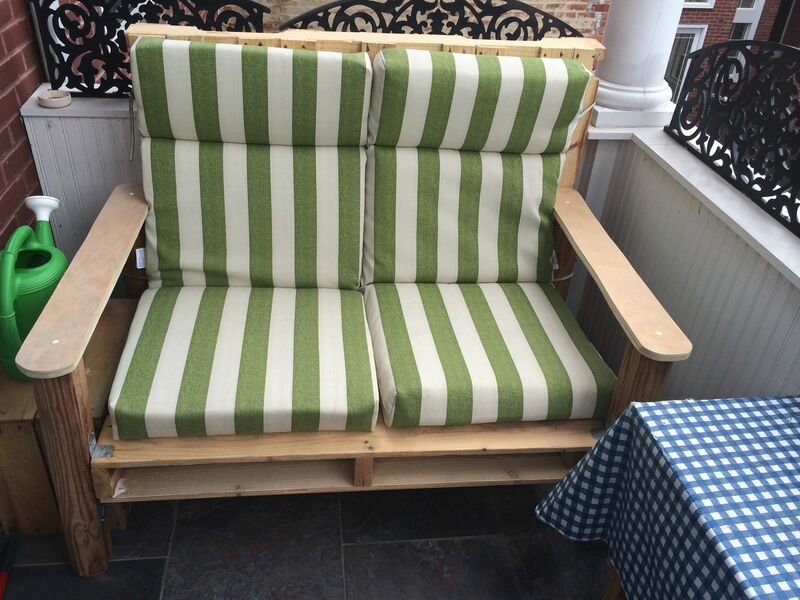 Desiring something super unique, this 2 full pallet chair was whipped up in a couple of hours, and is PERFECT for the non builder types! I just desired something you couldn’t find in a big box store. So I gathered up two like minded pallets, some reclaimed wood, and got to work. 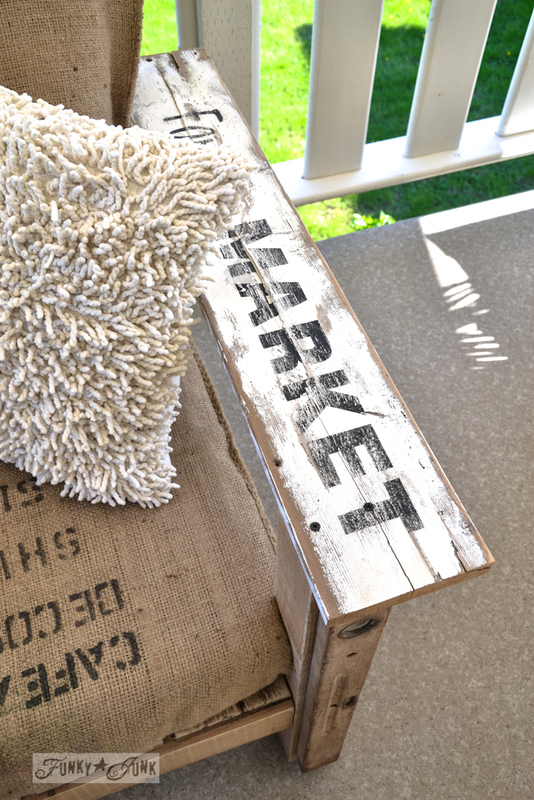 So here’s a little pallet wood and burlap coffee bean sack pillow eye candy! 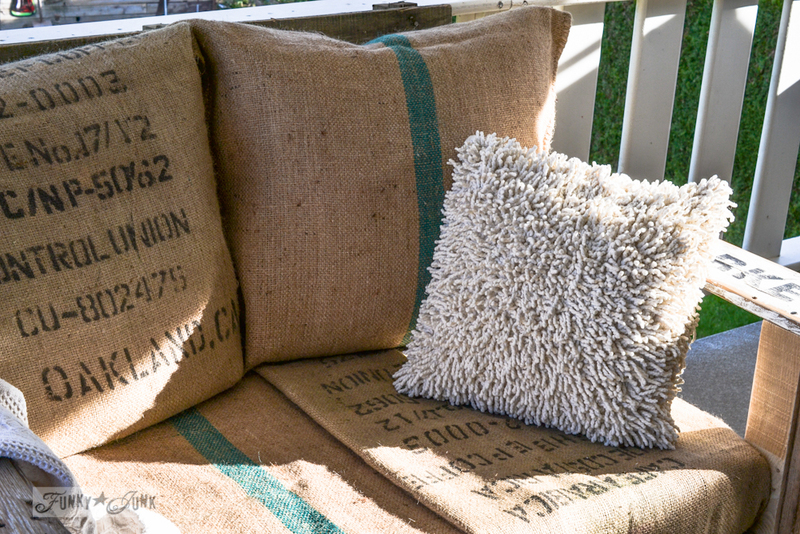 Burlap coffee bean sacks are the perfect no sew upholstery. They act as giant pillow cases that allow for large pillows to just slip inside. For the sitting area, I just loosely tucked them in place. The reason for the cheater upholstery is in PART 2 HERE. See how the large pillows were done HERE. 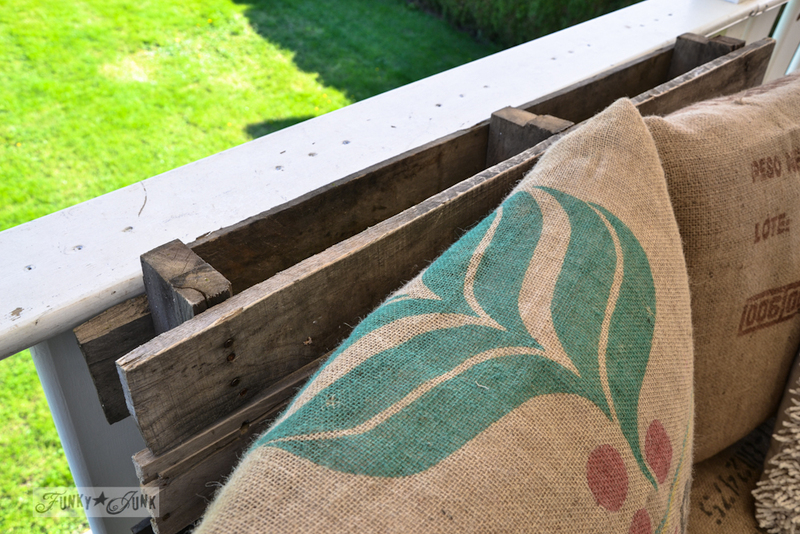 You can find coffee bean sacks at local coffee roasters in your area, or check places like ebay. Taking advantage of all the natural crate markings on the wood, I allowed them to become the artwork. Pretty funky, huh? I vote to celebrate that it IS pallet wood. Both arms are different which I love. I used a sign I had created on a board and just cut to size. This leg got a little extra detail with an antique wooden level. It’s the tiniest little details that you fall for. And yeah, the board cracked because I didn’t predrill. More on that in Part 2. 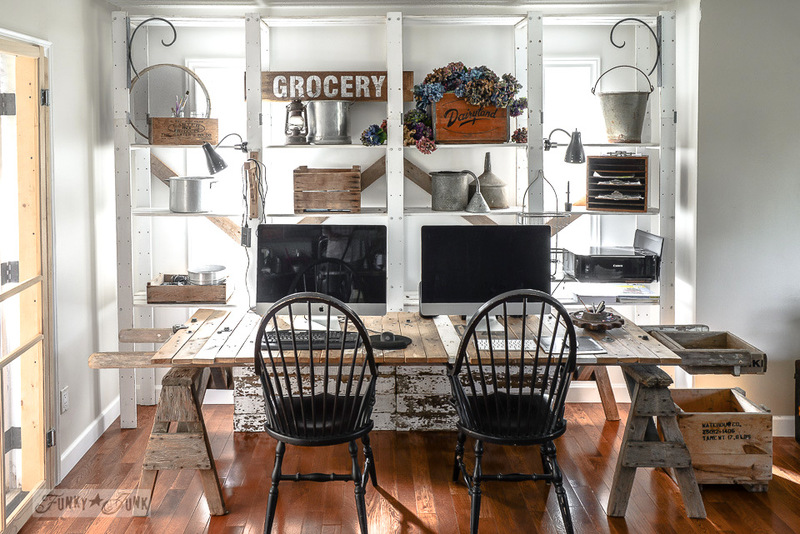 Not wishing to obstruct the outdoor mountain view behind the chair, a pallet the same height as the railing was chosen as the backer. 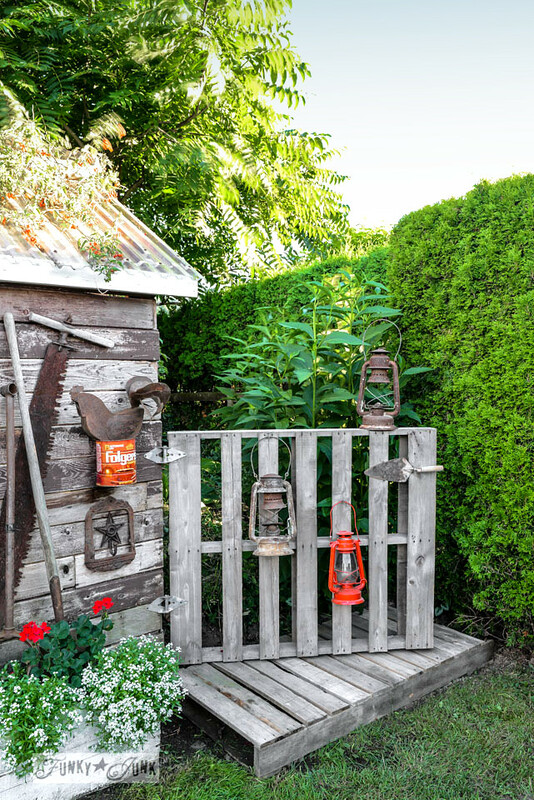 If one didn’t love the look of a pallet backing, you could always build a little gate look which I nearly did, but decided no. This round, it was about grouping up 2 pallets intact. The oversized pillows cover it anyway! And there you have it! A double wide sized chair. Or mini loveseat. The cool part is, the pallets you choose will determine what size you make this guy. We adore it!! 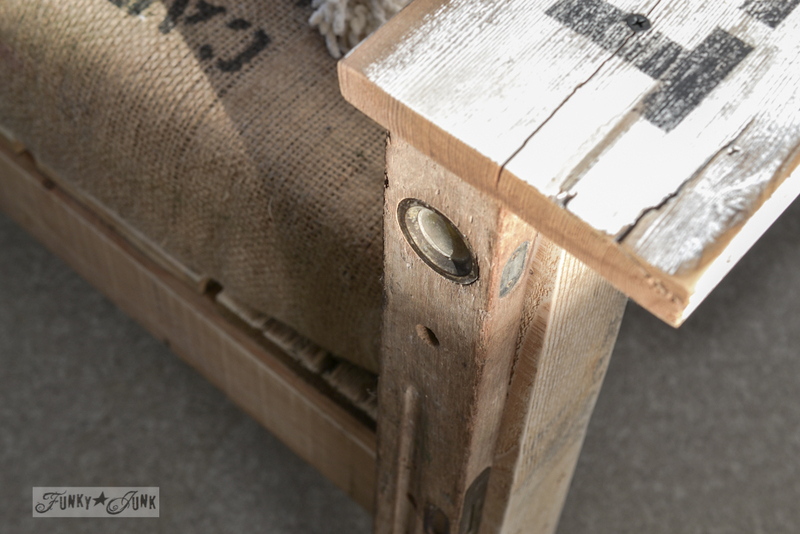 How to build the pallet wood chair part 2 is below! 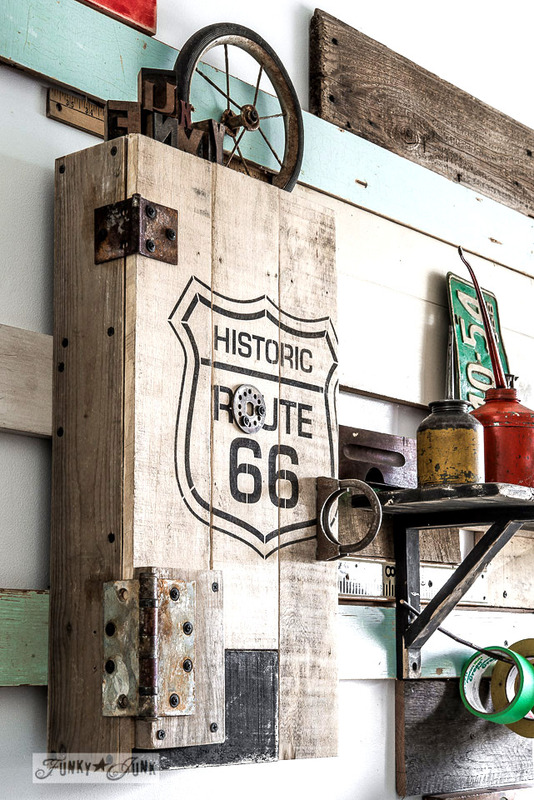 If you adore working with pallets as much as I do, you’ll LOVE this amazing clipboard I’ve curated from Hometalk! How to know if pallet wood is safe. What an amazing project. You have to just stand back and pat yourself on the back after all of your hard work. I can’t even begin to tell you how you have inspired me over the years. 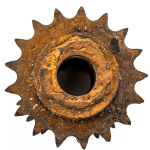 I wonder if you could help me make a quick decision on my blog. It will only take a minute and I would love to have other people’s opinion as well. We are building something for a Charity auction for kids and we want to make the right decision and your input would mean the world to us. This is way past awesome!! I love it! Oh wow I love this pallet chair in so many ways!!! 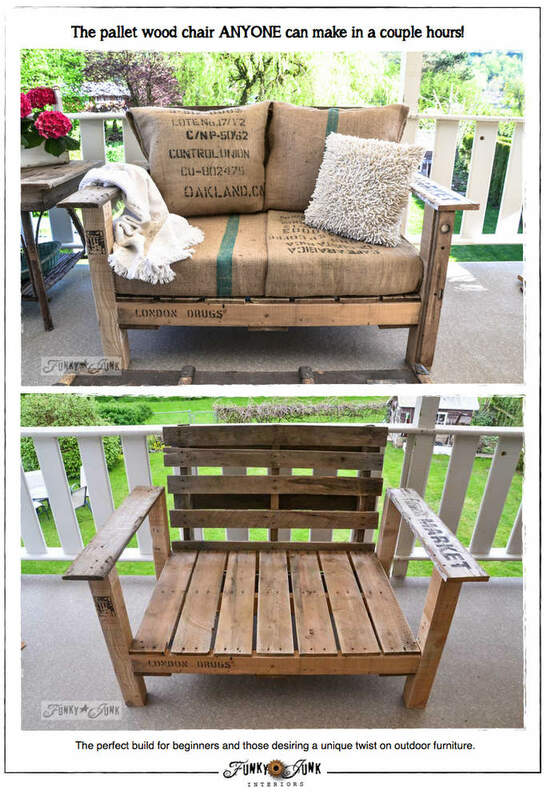 I wish I needed furniture for outside because I would totally make this!!! Katie, I gotta tell ya… this thing is so comfy it would make wonderful indoor furniture! I’m seriously debating on doing that! Do you have instrutions on how to build it? 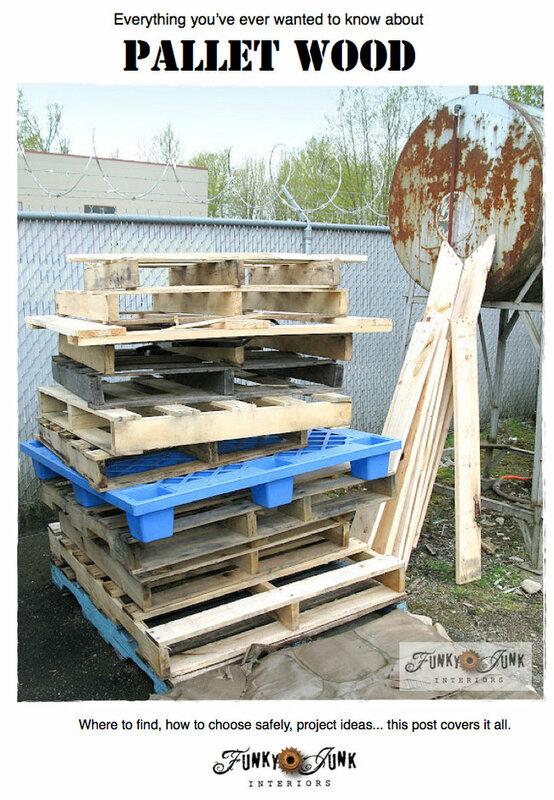 I have a few pallets id like to try and build one. I love working with pallets. I’ve been looking for a simple furniture design to use on a wood deck I just finished. This is perfect!! So far I’ve made 5 hanging pallet planters, a really cool headboard and potting bench and some other smaller items. There is no end to what you can do. Can’t wait to check out part 2. Great job Donna, and so YOU! Your style is so fun! What a great project. The porch and pillow vignette is charming. When does part 2 come out?!? Such an awesome idea I’d love to do! Fabulous look and great job building it! You rock!!! Donna, this is so cool! 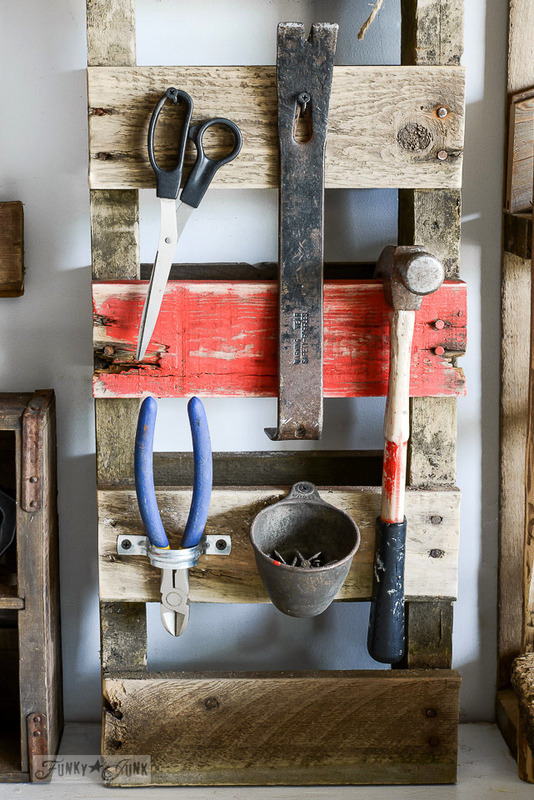 My husband and I have been admiring your pallet projects lately because we have a few we’d like to tackle. Thanks so much for the ideas and inspiration! This is so amazingly cool! I love everything about it, especially the cushions! Donna have I told you lately how amazingly talented you are? I haven’t well YOU are amazingly talented! Love this idea….Brilliant! Super cool chair with so much style too!Only you could think to do something so chic and unique like this! You are just amazing! Love the look for our really rustic cabin (outhouse too) in Adirondacks, NY. This would be great on the little porch and fit right in! 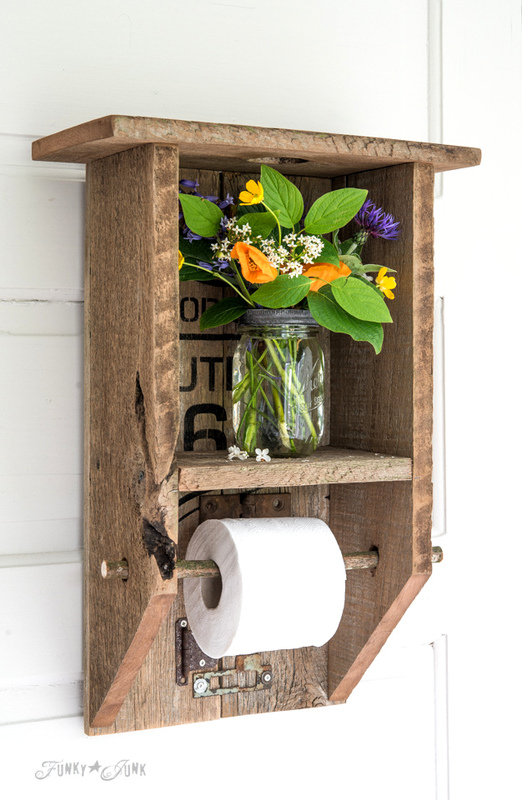 I love the idea of taking a very basic thing and making something functional and beautiful! I love the sign for the arm, the words on the wood and the sack fabric with the print. Great job, Donna! I have two big pallets sitting in my driveway. YOu have inspired me to get busy on them. 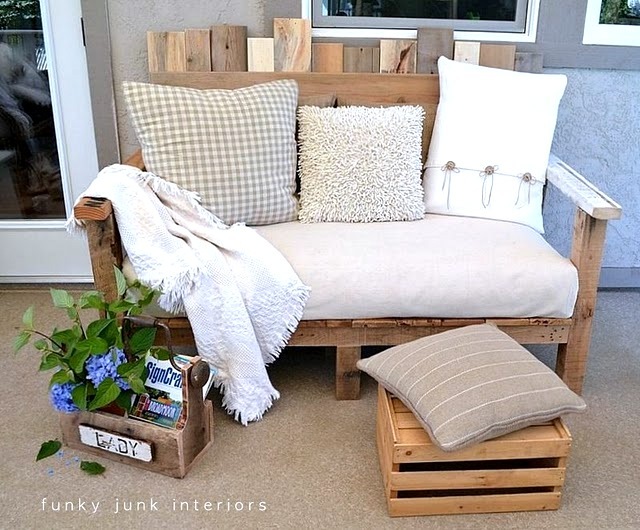 What a great chair and a very creative use for pallets! Kudos!!! Love this! Thank you for making it simple and quick. I’m going to attempt to make two of these to sit down near our farm pond. May have to drill a hole in the arm to hold a fishing pole! Thanks again Donna! Blessings and keep sharing! I can’t wait to show this to my resourceful husband and sons. I have started to walk in nicer neighborhoods and pick through their cast offs. Now don’t get all up on this (I go to the door for an OK). We have been doing some garden boxes from the book “Lasagna Gardening” out of my finds and scrap wood. They aren’t as nice as this chair though. Now I will be out looking for pallets. You are sooooo awesome! Wonder Woman! yeah! My kind of chick! I love it! You did a Fantastic job! I love working with wood, and made a breakfast bar at my great-grandparents acreage in Rokeby, Nebraska. It was a blast!!! Now….I’m definitely going to try the coffee table out!!! Thanks!!!! Donna you inspired me to try to build my first furniture from pallets. It will be our sofa for the leaving room. Please continue with your wonderful creativity. Many thanks to share with all of us. Oh boy here we go with another pallet project. Almost every time I read my blog emails I print out at least one pallet project. Poor hubs says he’ll be making things til the cows come home. Love the chair, great project. 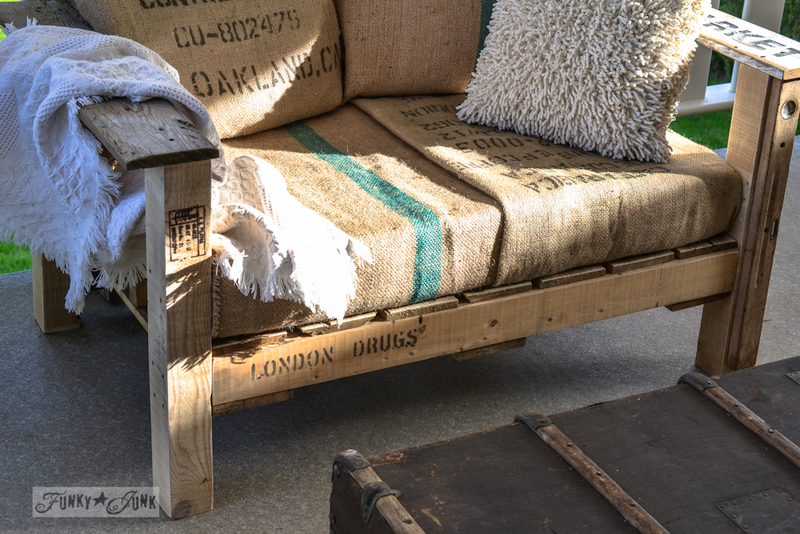 We have lots of pallets and some other lumber so will be able to make this. Maybe keep it for our back deck. Sure glad I found your posts on Furniture Feature Friday. I find some of the best projects on the blog parties. Hooray. Great post and love your blog. Oh this is Beautiful! Thank you so much for this i am going to make one of these for my den! Any suggestions on taking pallets apart easily? Thanks you! Wow! It looks really great! 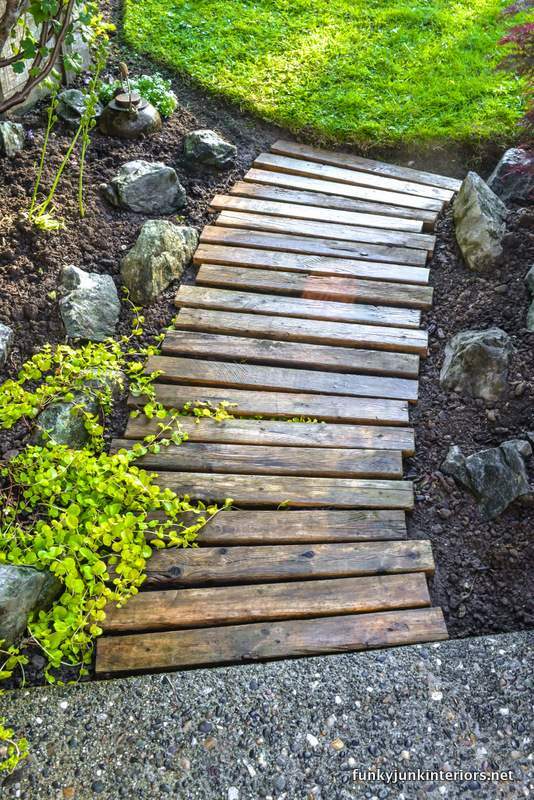 This project is definitely going on our to do list for this summer! Thank you so much for sharing. This is so adorable! Thank you so much for sharing. This is awesome!! I love it! I have a couple of pallets just screaming my name. 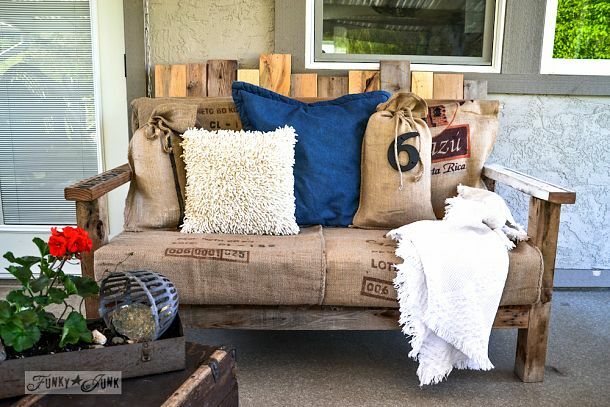 Just 1 question, Where in the world would I find the burlap sacks?? Can ya tell I’m not a country girl?? LOL! Hey Mary! I suggest to check around at a local coffee roaster. They always have them on hand, and for a decent price! I love it, but my first thought as a mama of two busy boys is that it would be dangerous having the chair against the railing up high! Ha! Funny how you notice all these things. 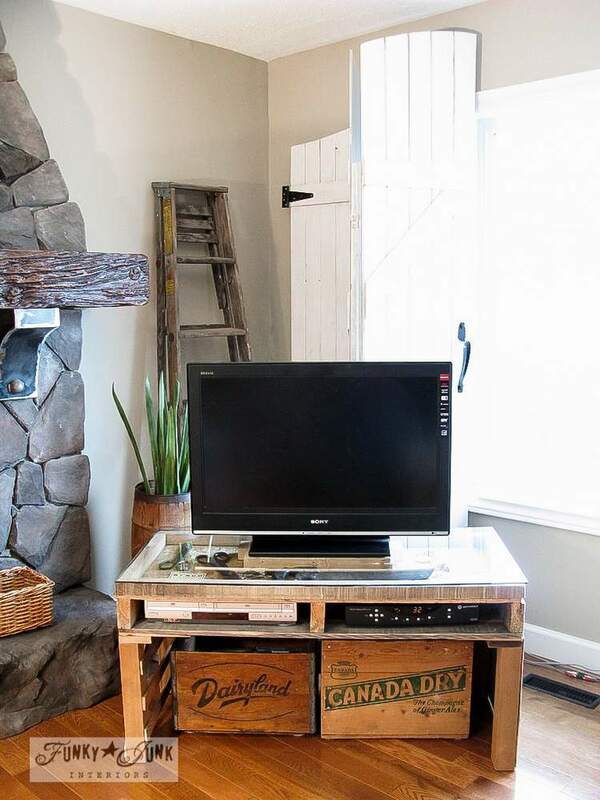 You are so clever making these pallet creations. Thanks for sharing! 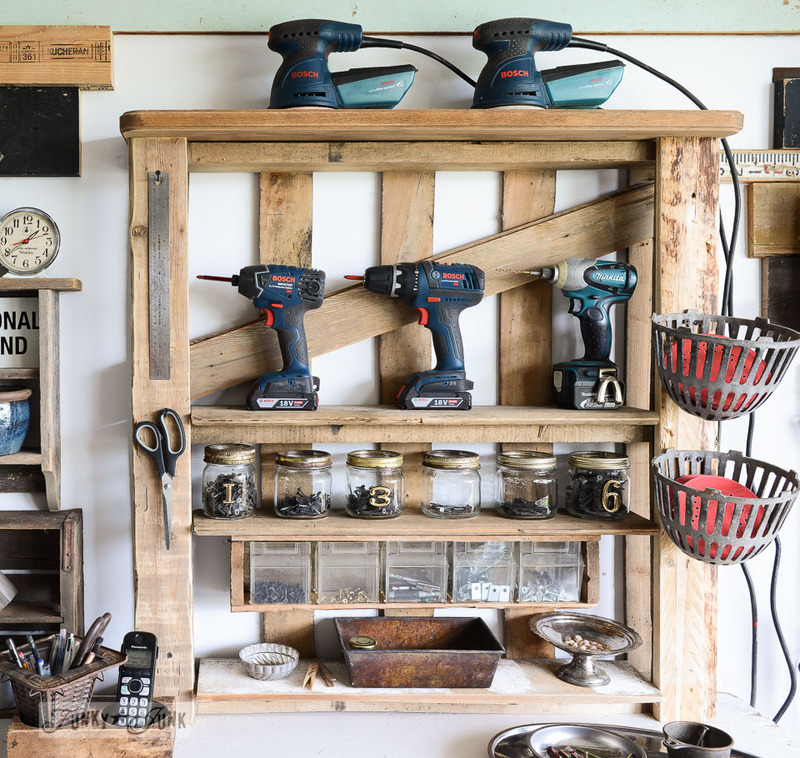 My grandfather and grandmother worked in a little rustic woodshop behind my home growing up. They owned and operated a very small business making wood pallets for a local lumber shop. We grew up listening to the soothing sound of either a saw cutting the wood or both of them hammering away making the pallets! All of the grandchildren loved to play King of the Mountain on the piles of sawdust they had. Many great memories and I have often thought it would mean a lot to do something with a pallet in memory of them! I just want to say how awesome your website is, you have inspired me to try sooo much! 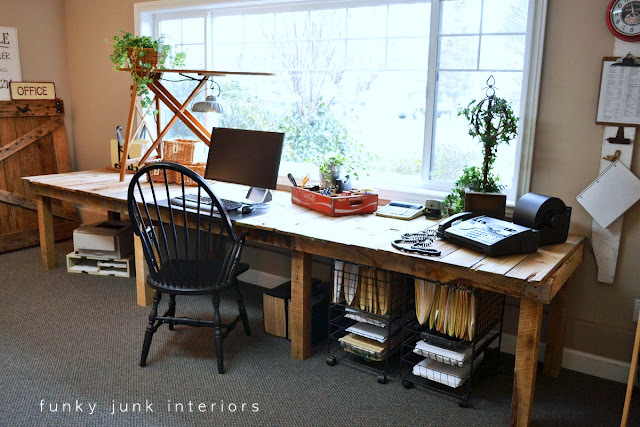 I am actually debating trying to replicate your blogging desk, i’m absolutely in love with it and my boyfriend would really enjoy the rustic meets modern feel. Oh my…. so fabulous! Way to go!!!! Thanks so much for sharing yours, it’s gorgeous! I can’t seem to figure out How you attach the back pallet so that it has show lean and isn’t a 90°angle. Can you give any tips on that? Hey Scott, mine leaned against the wall so I didn’t have to worry about it. But I’d think if you extended the arms towards the back and installed a cross beam, that would support a leaning back nicely! Thanks! That should work! I can’t wait to try it! Where did you get the coffee bean burlap sacs?? Where can I get the plans? Sorry, was being really blond there, found them! I use a table top miter saw to cut nearly all my wood. 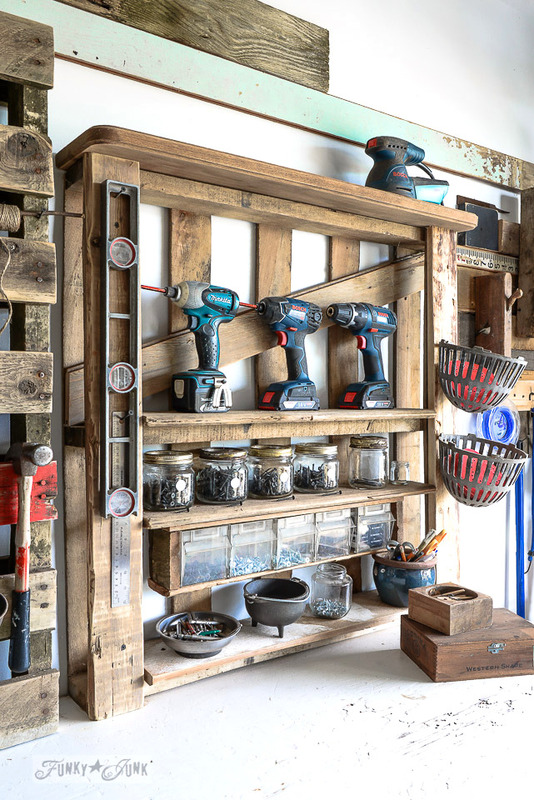 It’s very worth the investment to have one, makes DIY nearly effortless! I may have used 4″ deck screws which I found at my local hardware store. I’d think most places would carry such a standard thing. What I’d do is measure the wood prior, then just make sure your screws are longer. And don’t you worry… with any new project, comes TONS of growing pains. They happen to me every single day. Just think of all the things you’ll know about after this one is a wrap. 🙂 Don’t quit! Now I know how to make a cool pallet wood chair. Add me to your email/follow list! LOVE your site! Just came up on it via Pinterest. Keep the ideas coming! and, thanks! Can you please just post simple step by tep instructions without wading through all the pictures and cruft? Thanks. 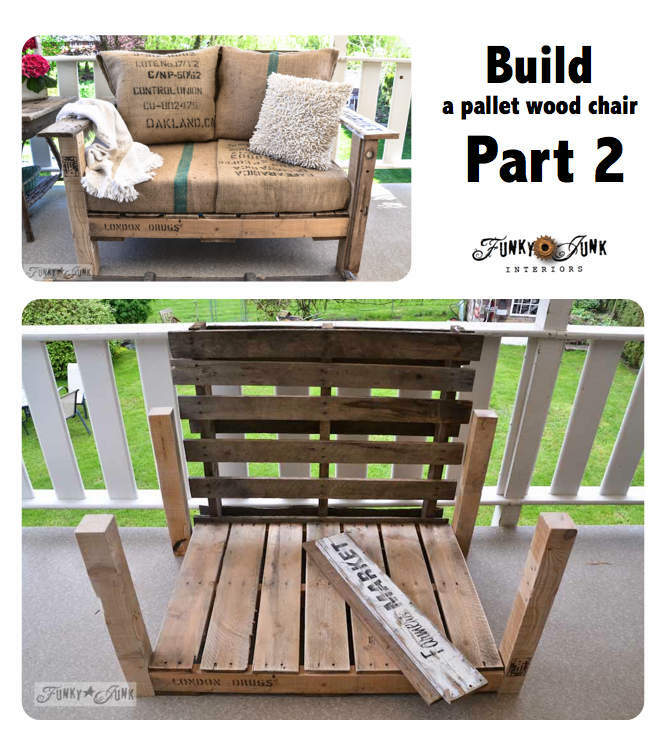 Did you click PART 2 – HOW TO BUILD THE PALLET WOOD CHAIR in this post? That’s where the nitty gritty is. Love the chairs, nice work. Thank you for sharing . Will try this next spring.